A year ago these cars made no sense. A lakh more for some puffy bumpers meant only the style obsessed bought these hopped up cars. 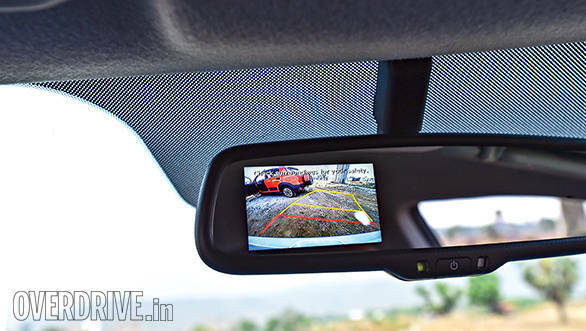 But today the game has changed with the Avventura and now the new i20 Active. These cars are closer to the real deal with raised suspension and more features over their standard siblings. Finally, there's actually a valid reason to buy one. We wanted to compare every 'cross' car available but Volkswagen didn't have a Cross Polo to give us. And from the couple of dealerships we spoke to, one claims the car is out of production while the other says it is available on order. In simple terms the Volkswagen Cross Polo doesn't seem to be selling in very significant numbers. 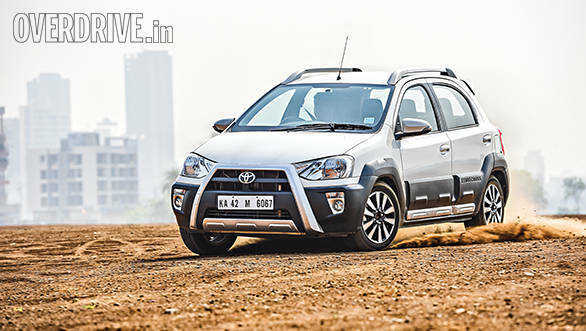 That leaves the Toyota Etios Cross to take on the new Hyundai i20 Active and Fiat Avventura. Perhaps one of the most important aspects of this test and a big win for the Fiat. On both our shoot days, people would march right past the other two and question us about the lurid orange Avventura. Full credit to Fiat here as they seem to have put in the most effort into turning a road going car into something more butch and attention grabbing. I believe it looks a lot nicer than the Punto Evo which lost out on some of the original Punto's handsomeness. But on the Avventura, chunky wheel arches, a powerful face and that boot mounted rear wheel come together to produce a very handsome machine. What I don't like about the rear wheel is the complicated process required to open the boot. First you have to unlock the wheel using a button in the dash or on the key, then release the mechanism and swing it away. Only after this can you access the boot opening mechanism. If you've forgotten something and need to open the boot again it means going back to the cabin to unlock the wheel if you don't have the key on you. The insides have a likeable art deco feel to them. I especially like the unusual finish of the soft feel dashboard material and the tasty piped fabric on the seats. But the old Fiat vices continue. The driving position is all wrong, plastic quality is great in parts and very average in others and despite feeling like the biggest car here it has the most cramped cabin. The Blue&Me Bluetooth system is also quite tedious to connect to and doesn't support audio streaming. 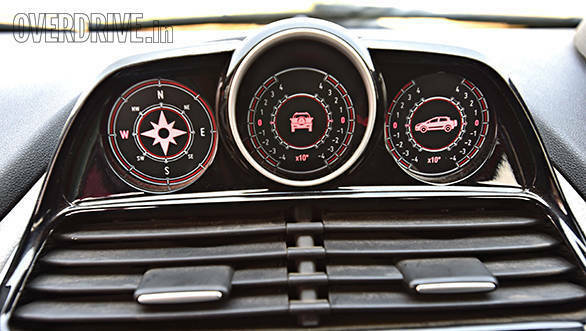 Fiat added an interesting touch in the dash mounted gauge cluster that houses a compass and incline/tilt meters. But they're pretty pointless in a vehicle like this and the only useful information they provided was the angle of the speed breakers on my commute in a northeasterly direction home. A rear AC vent is a nice touch though. Like with the Punto Evo and Linea, living with the Avventura is definitely a give and take experience. The Hyundai on the other hand just wants to give and its sole function in life is to please. 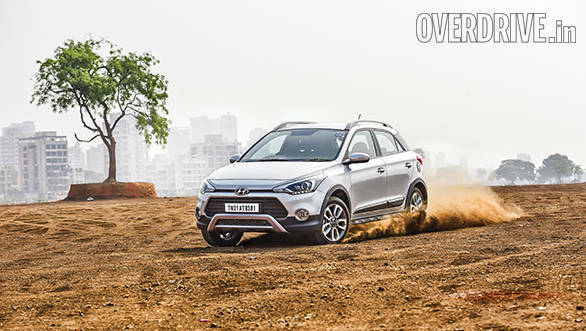 The Elite i20 is, to my eyes, one of the best looking current hatches and Hyundai has done a good job of dressing it up for this rugged appearance. It's not an overdone design and I like the addition of fog lamps upfront with corresponding circular elements in the rear bumper. The left one serves as a reflector while the right one houses the reverse lamp. A minor eye sore is that the 20mm of extra ground clearance (now 190mm) over the standard i20 has exposed the mechanicals in the wheel arches. 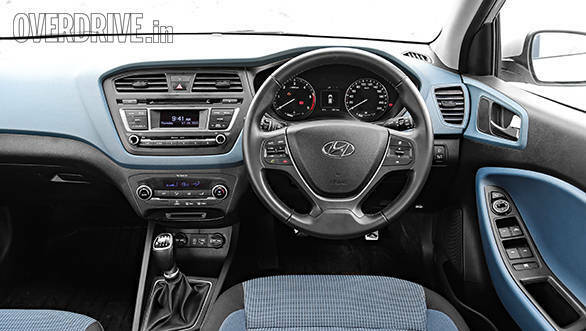 On the inside, the Active retains the handsome dash from the Elite i20. It drops Hyundai's previous exuberant designs for a clean and sophisticated layout. Here, Hyundai offers it with two colour trims. Cars in orange and red exterior colours get orange trim on the dash and seats while the other colours get this cool blue detailing you see here. I'm not entirely sold on it but it definitely is unique and in no way offensive to look at. 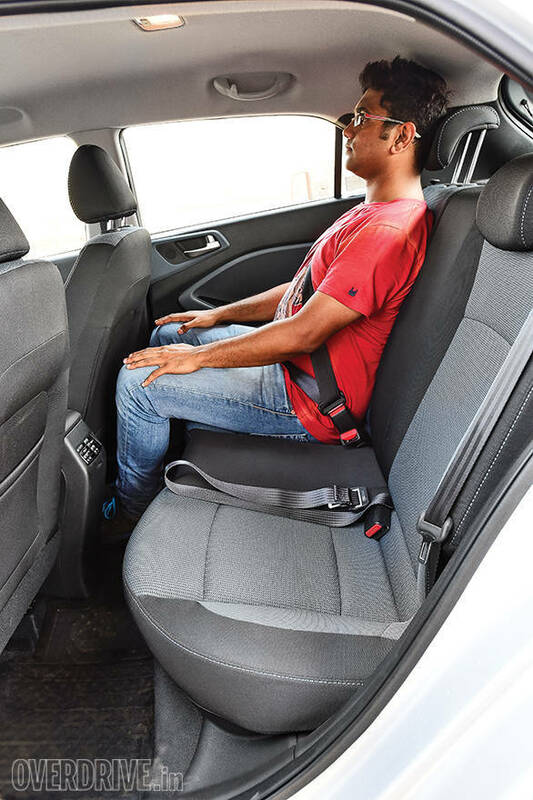 Because it's a Hyundai, the cabin is packed with features, has a very comfortable driving position thanks to proper rake and reach adjustability in the steering wheel and has generous space - just a little less than the Etios Cross. Plenty of thought has gone into the cabin like the cooled glovebox and dual 12V power outlets in the dash. I also like the dual direction rear AC vent which directs cool air at passengers on both, unlike the Avventura. The audio system is the best here in terms of sound quality and ease of use. Both the Fiat and the Hyundai give you comprehensive trip information but the Hyundai presents it much better through the crisp, ultra-legible, well laid-out instrument cluster. The only negative I felt with was that the arm rest on the door pad could have been softer instead of the hard plastic your elbow rests on. 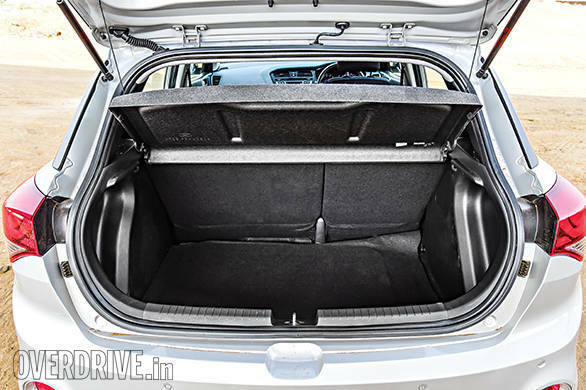 All told, the i20 Active has the best cabin here by quite a margin. And that brings us to the Etios Cross. Kudos to Toyota for the effort they've put into the design. It may not be their best looking but it does get noticed and the exaggerated bodywork adds some drama to the Liva's old school but likeable lines. The Etios Cross is the only one here without an increase in ground clearance (to be fair its 170mm poses no problems) and it also runs smaller 15-inch wheels with slim 185-section tyres. 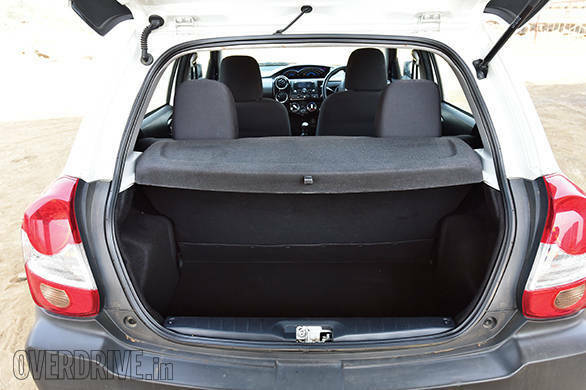 Its 251-litre boot is the smallest and also has a higher sill and large intrusions like on the larger 280-litre Fiat. 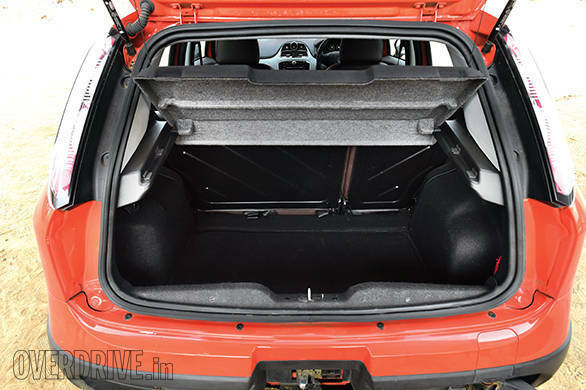 The Hyundai scores another win with the largest (285-litre) and easiest boot to load with the least intrusions. 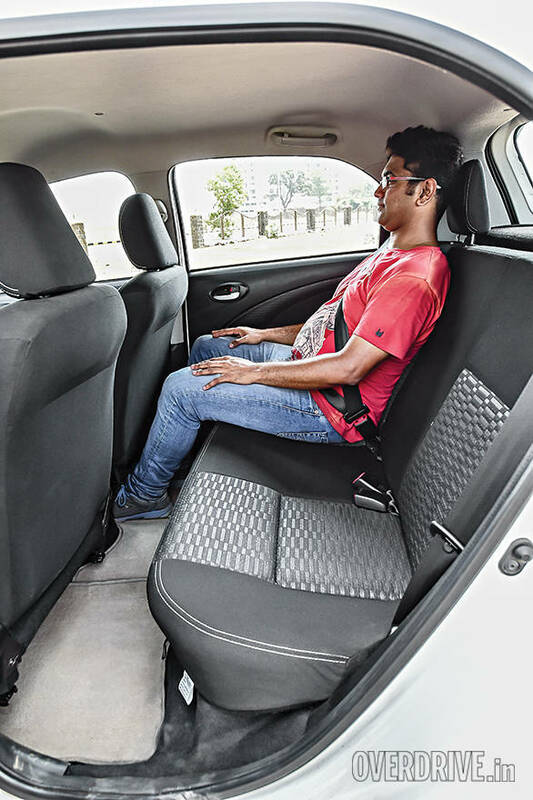 The Etios has a solid rear seat unlike the other two with their 60-40 folding rear seats. 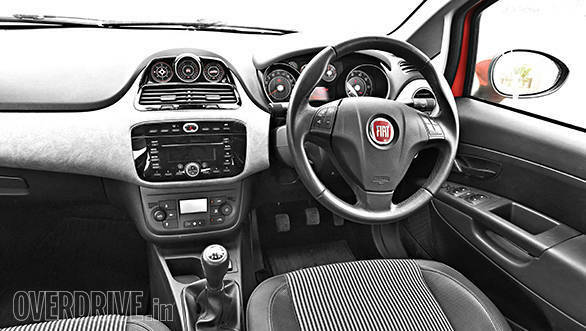 But it's the interiors that deal the biggest blow to the Etios Cross. After the luxurious Hyundai, and the classy Fiat it feels like you've gone a segment lower and back by five years. The hard plastics and glossy black finish dash finish don't make the cut. In fact, the overall layout with its aftermarket looking Bluetooth compatible stereo, offset AC vents, and tacky centre mounted instrument cluster is disappointing and out of place in this company. Scrounging back some points is the highly spacious cabin but again the flat seats bring down the feel good factor. 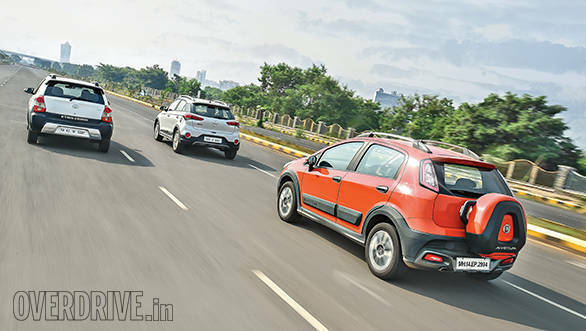 With 93PS, the Avventura is the most powerful car here but in our test it turns out to be the slowest from 0-100kmph taking a lazy 15.6s. This is down to the to Fiat's portly 1255kg kerb weight as well as the gearing. However, the engine feels strong and flexible at low speeds and you can use second gear at almost anything more than 5kmph. 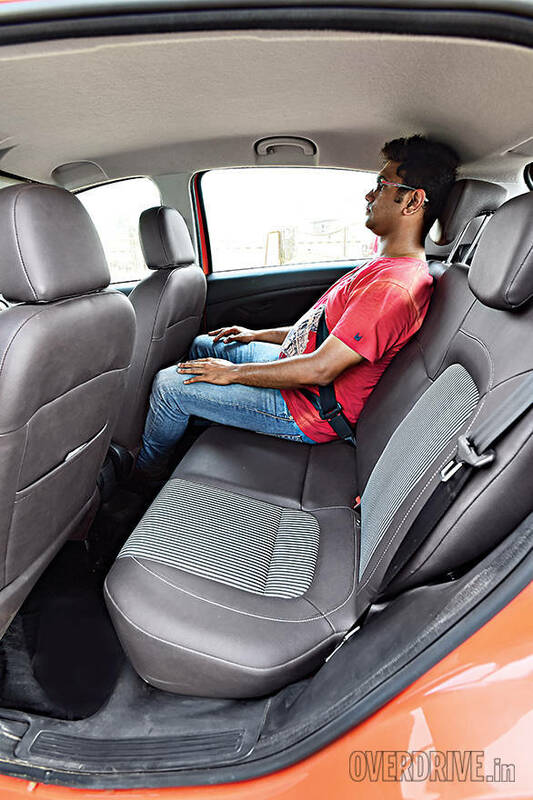 Clutch effort is quite light but it is a long travel clutch that gets tedious thanks to the arms-stretched-out, legs-crunched-up driving position. Efficiency has always been a MultiJet strong point and the Fiat returns a fair 15.7kmpl, but it's still some way off the other two. The engine also feels rather loud and gruff especially in comparison with the Hyundai. I was sold on the i20's drivetrain after a brisk drive from Pune to Mumbai with four passengers and lots of riding kit in the boot. At high triple digit speeds, the engine feels absolutely smooth and NVH levels are amazingly low for a vehicle in this segment. The 1.4-litre diesel engine stays smooth and highly refined at all times. 90PS is a good number but its the 220Nm of torque (peaks from a low 1,500-2,750rpm) that makes this engine's case. The Hyundai has a different power delivery from the other two. It has some lag till 2,000rpm after which there's an enjoyably strong surge that tapers off at about 4,500rpm, just short of the redline. The lag isn't bad enough to hamper low speed driveability but it feels evident because of the strong surge ahead. The Active is considerably quicker than the other two with a 12.6s 0-100kmph run and it can comfortably cruise at speeds as high as 150kmph. This is also the only car with a 6-speed box - a smooth and precise unit with well spaced ratios. The medium travel clutch is the lightest as well. The Active is not just quick but its ultra smooth engine and slick gearbox also make it the most pleasurable to drive, no matter the speed. The icing on the cake is that it is just as efficient as the Toyota with an overall 17.9kmpl. The Toyota with its old school eight-valve 68PS/170Nm engine sounds terribly underpowered but is in fact quite a pleasant experience. The engine has a meaty bottom end and mid range that feels a lot stronger than the specification sheet would suggest. It's also mated to the nicest feeling gearbox here with short throws and a satisfyingly precise feel. Despite its efficiency, the age of the engine feels apparent and the Etios comes across as the loudest of the lot. The heavy short travel clutch also gets quite tiring in traffic. Here's where the Avventura shines. At low speeds it has a nice and absorptive nature but it does feel a little stiffer (Fiat did firm up the suspension when they raised it to 205mm) than the Punto Evo. Low speed ride comfort is still very good but the new firmness helps when the pace is upped. 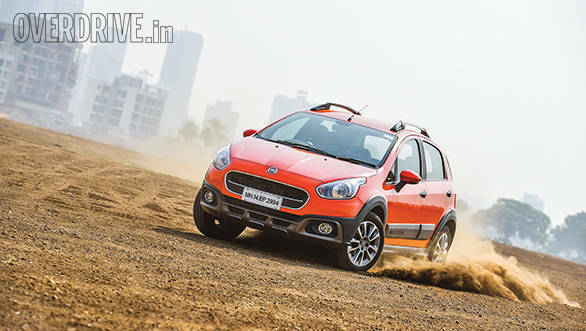 The Avventura feels more planted at speed than the Evo which we have found can get a little bouncy. The Avventura also has hydraulic steering which is heavy and tedious at town speeds but livens up when you start to drive hard. It's not the best steering (that would be the Ford Figo) we've experienced but it is undoubtedly a more feelsome unit than the other two. 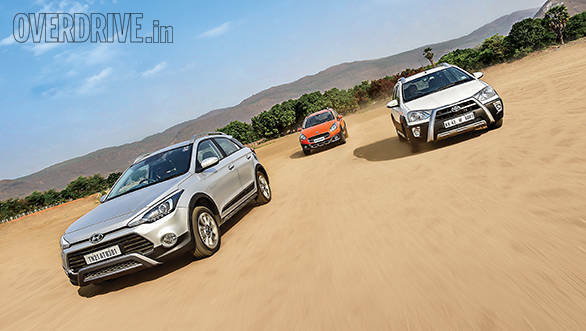 Like with the engine, Hyundai has done a commendable job with the Active's suspension. The days of wallowy and bouncy Hyundais are history. Ride quality is actually better than on the Elite i20 and it soaks up bumps at low speeds just as well as it handles high speed encounters with expansion gaps. It's not quite as soft as the Toyota or as sharp a handler as the Fiat but it runs both very close. Couple that with its comfy cabin and this is the car passengers will be happiest in. The electric steering has very little of the vagueness that plagued earlier Hyundais but it is still occasionally noticeable at low speeds. It's not the best here but the steering is far from hateful and something I could live with. High speed stability is good and the handling is direct and sure footed. My time with the i20 Active has convinced me that this is one of the best driving Hyundais available in India. All three of these cars ride and handle quite well but in terms of sheer comfort the Toyota edges it. It feels very soft and absorptive at low speeds but also has quite a bit of body roll. The interesting thing is that if you ignore the roll, you will be surprised by the grip on offer and the amount of fun that can be had behind the wheel. I've raced the Etios but even in stock form this car is good fun to throw around. What I dislike is that the steering has excessive turns to lock which can occasionally catch you by surprise especially while taking u-turns - you think the front wheels have returned to centre but there's often one more rotation of the steering wheel required. Between the Avventura and the Toyota, it's the Fiat that we favour. 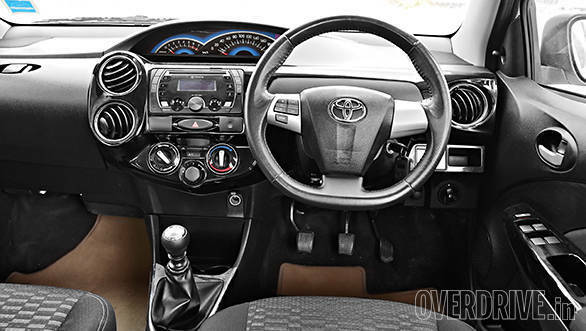 The Etios is based on a thoroughly sound mechanical package but its interiors are a big let down. Yes it is the most affordable here but the car certainly doesn't generate the feel good factor you would expect after paying Rs 8.5 lakh for it (all prices on-road Mumbai). However full points to Toyota for offering two airbags and ABS as standard on all but the base petrol variants. The Fiat offers tons of style and presence but below that is an ageing platform that while undoubtedly charismatic is in strong need of a generation change. The Rs 10.29 lakh Avventura is also quite expensive and doesn't come remotely close to the value the Hyundai presents. At Rs 10.8 lakh the Hyundai is the most expensive by quite a margin but it is actually the best VFM. Consider what the Hyundai gives you above the other two - auto headlamps, projector beams, LED DRLs, cornering lamps, parking sensors (the Fiat desperately needs this), reverse camera, keyless entry, push button start, a cooled glovebox, auto day-night rear view mirror and electric folding outside mirrors. Now factor in the fact that it looks great, is comfortable, lovely to drive and comes with Hyundai's reputed after sales experience (not to mention resale value). The Hyundai i20 Active is the clear and absolute winner here. For the first time, a 'cross car' may actually make more sense than its standard sibling and even some more expensive sedans.